AutoPay does everything that Auto-topup and much more! How do I arrange for my account to top up from my Credit or Debit Card automatically? If you're often travelling, or experience unpredictable call volumes that make it difficult to judge when you need to add credit to your account, Auto Top-Up can give you peace of mind. By arranging a mandate for your top-up, you can ensure that your account never runs out of credit. Just follow these steps to set up Auto Top-Up. Simply send us an email to support@dmclub.net asking for a PDF version of the auto topup mandate form. 4) Confirm your address details. Make sure they're the same as those on the card you've registered with dmClub! 6) dmClub Support will be notified that you want to arrange Auto Top-Up, and they'll put a mandate form in the post for you. All you have to do is complete the details and post it back, and that's it - peace of mind. Please note that we can only send mandate forms to UK mainland addresses so if you are in a different country please request an email form. How do I update/cancel my mandate? You an change or cancel your auto-topup mandate at any time through your clubhouse. 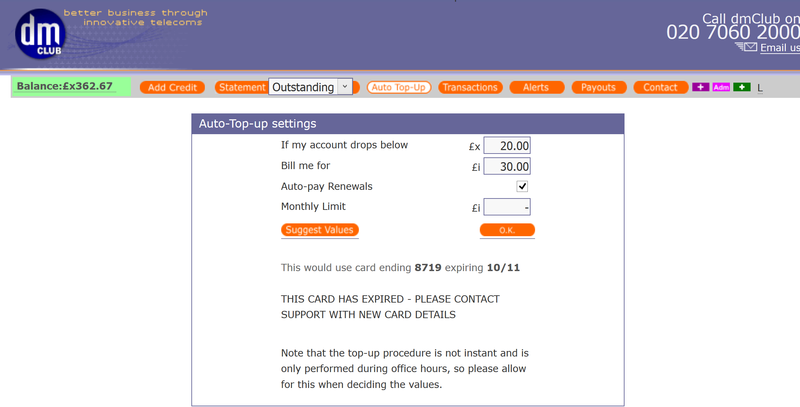 In this example the customer should set up a new mandate, as their old credit card has expired. Simply email support (support@dmclub.net) with the subject line "New mandate form for DMID <your DMID> please"
How do I cancel my auto top-up? Please send an email to support@dmclub.net stating that you wish to cancel your auto top-up/auto renewals. In the email, please also state your DMID (login email address) so that we can easily locate your account. You will then receive written confirmation from us that this has been cancelled.